We offer a variety of options for food allergies, special diets, and food requests. Our number one concern is food safety. We can remove any ingredients. You can provide your own substitutes, but we cannot buy substitute items for allergens. You can request use of your own cooking tools. TIP If you have a gluten allergy, order gluten-free dinners rather than regular dinners with substitutions. Since your Elf is cooking just for you, you can flag your allergies in your profile. 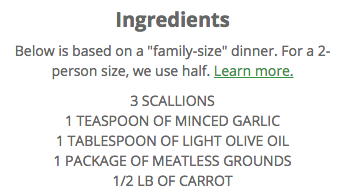 Click the i icon to see the full list of ingredients and quantities for any recipe. We do not offer nutritional labels yet. If you're concerned about cross-contact, we don't recommend using us. Elves use common kitchen tools and staples between homes. Some grocery items may have been processed in facilities where cross-contact with allergens could occur. IMPORTANT If you have celiac disease, we don't recommend you use Dinner Elf. 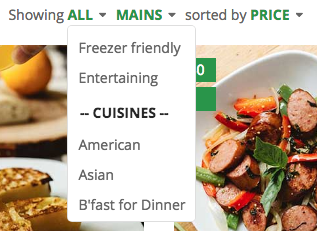 Use our filters to search by diets, cuisines, and more. 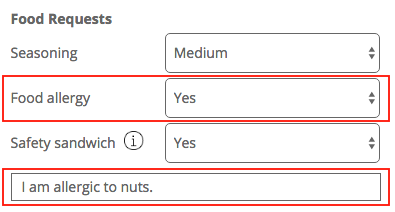 Vegan - Select this option under our protein header. 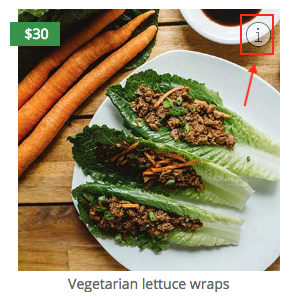 (G) Gluten free - Our gluten-free dinners may have cross-contamination. Whole30 - Dinners with the "W30" prefix comply with the rules of the Whole30 nutritional program. Get all of the unprocessed goodness without all the cooking! DASH diet - Dinners with the "DASH" prefix comply with the DASH diet. Paleo - All dinners in our Whole30 menu are paleo compliant. Over time, we'll add more filters for other diets. Let us know what you'd like to see.